Let's welcome a new store to the SoCal area! Times have been tough for the scrapbooking industry lately, and especially tough on local scrapbook stores. It seems like there is a new one closing every week, for one reason or another. 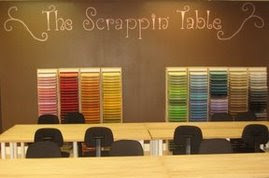 A few months ago we heard about Table Scrapz in Placentia closing and I don't know about you, but my thoughts were, "Oh, no ... another one bites the dust!" 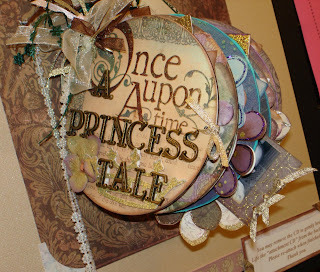 But out of the dusty ashes of Table Scrapz has risen a new, fresh scrapbook store in the same location: The Scrappin' Table. Store owner Michelle is excited, motivated and gracious and I encourage you to stop on in when you have a chance. Product is being added to the store every day (after a brief delay thanks to the midwest ice storms!) and it looks like Michelle, with the help of her scrappy friend Tiffany, is buying nothing but the latest and greatest. 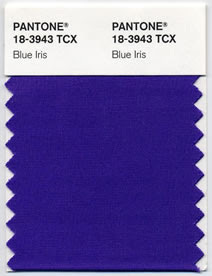 "From a color forecasting perspective, we have chosen PANTONE 18-3943 Blue Iris as the color of the year, as it best represents color direction in 2008 for fashion, cosmetics and home products," explains Leatrice Eiseman, executive director of the Pantone Color Institute®. "As a reflection of the times, Blue Iris brings together the dependable aspect of blue, underscored by a strong, soul-searching purple cast. Emotionally, it is anchoring and meditative with a touch of magic. Look for it artfully combined with deeper plums, red-browns, yellow-greens, grapes and grays." 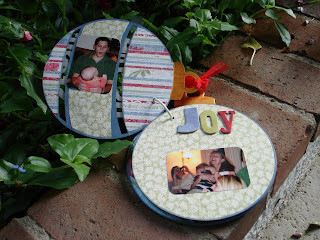 Upcoming classes and make and takes! Whew .. I am finally getting around to doing the samples that I have desperately needed to get done! 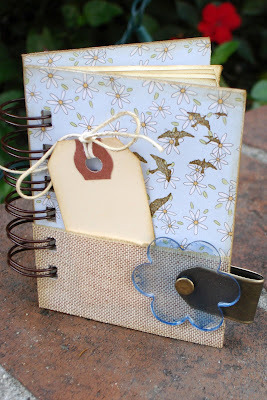 The small blue book is a make and take for Auntie Amy in Riverside. I will be at the Heirloom Stamp Show there Jan. 25 and 26. My "Clearly in Love" 6 x 6 acrylic album has already been sold out to the stores and you can see my schedule for those classes on my calendar. But I still had more stores to teach at, so I had to come up with another project! "Sweet Valentine" is an 8 x 8 acrylic album and I have, so far, have it scheduled at the new store, The Scrappin' Table in Placentia Jan. 23. 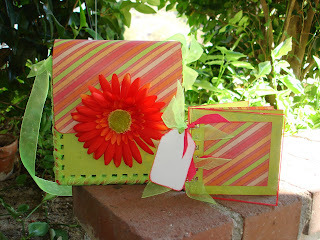 The other two projects I will be teaching at the Desert Scrappers retreat Jan. 11-13 in Palm Springs. For more info about any of these classes, log on to my web site calendar by clicking the link to the left, or typing this address into your browser: www.kits2remember.com/calendar. In this day and age, handmade gifts just aren't given often enough. I have been lucky to receive two handmade gifts so far this year. 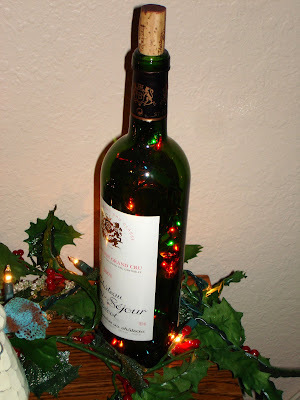 Scott Ogle (my DH's poker pal and hubby to my scrappy friend Judy) drilled a hole near the bottom of a wine bottle and fed Christmas lights into it. 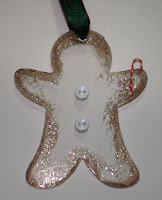 I really like this simple holiday decor item and have it displayed in my living room where I can see it all the time. The second gift is also in my living room, on a shelf that is tough to light. But the "Believe" framed shadow box scrapper April Peel of Victorville made me is just simply beautiful. 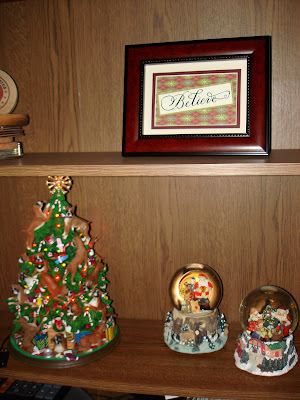 She used embossing beautifully and I had a space available on my shelf - it fits in great with my snow globes and boxer dog Christmas tree! Thanks for thinking of me! I know you are hearing a lot form me this month, but I have got so many exciting things going on! I just got word that my shipment of *new* products for 2008 is on its way and I have to make room! So, ALL project kits are on sale - up to 50 percent off - for a limited time while supplies last! So, take a look around, and if you have shopped K2R before, don't forget to cash in on your points to save even more money! After shopping for everyone else, now you can say Happy Holidays to YOU! Log on to www.kits2remember.com. Also, stay tuned for details about the brand new products available next month. 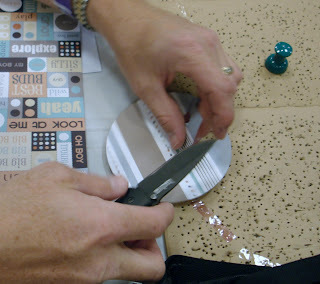 Plus, if you are in Southern California, you can register for K2R classes at two 2008 scrappy events: Scrapbook Expo in Orange County and Scrapbook Alley in Ontario. Visit www.kits2remember.com/calendar for more info! Don't forget: If you have questions about acrylic, ideas, mini books - you name it - the K2R message board is where you can post questions, answers and info for other like-minded, mini-book-making people! 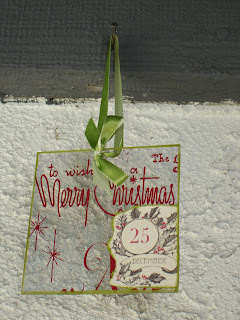 I hope you have a wonderful holiday season and thank you for your support in 2007! I couldn't have done it without you! EK is asking for my opinion ....?! Anyone who knows me knows that I am not afraid to express my opinion, and now a scrapbook company is actually asking for it! Wonders never cease! They sent me the first product, the new Sticko adhesive, in a pink container (yuck! They lost a point of mine there ...). 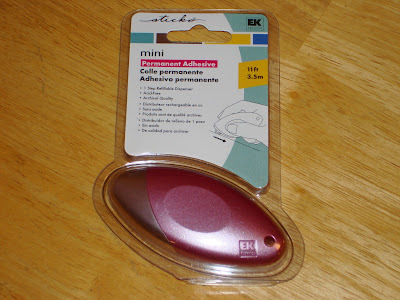 I got the mini adhesive and being the busy scrapbooker I am, this 11 feet of adhesive was gone in a flash! But, the adhesive itself was strong and easy to use, much like an ATG-type double-sided tape. It IS refillable, but I hate refilling too often, hence the reason I use the ATG gun and tape. So, while this wasn't a huge winner with me, it was still fun filling out the survey and letting EK know my thoughts! Stay tuned for more reviews in the coming months. This is the class project I am teaching for January and early February. 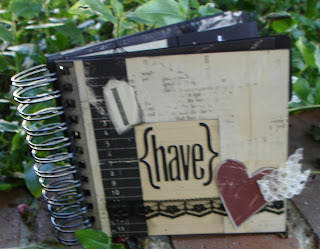 If you'd like to see if I am teaching at a store near you, log on to www.kits2remember.com/calendar. 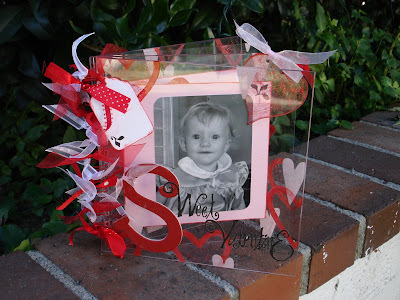 "Clearly in Love" is a 6 x 6 acrylic album that features Creative Imaginations paper and embellishments, acrylic shapes (large tag and "love" word), acrylic paint, Stickles, and of course, ribbon! 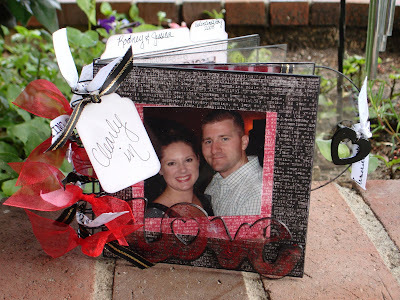 This project has the hubby's stamp of approval for being romantic but not too "girlie," so, hopefully your significant other will agree when you proudly give it to them this Valentine's Day! I'll be teaching at Expo! I am excited to announce that I will be teaching at Scrapbook Expo for the first time at the Orange County show in February! 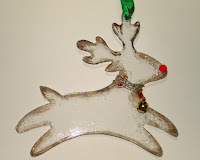 I will have two classes each morning (Friday, Saturday, Sunday), both featuring acrylic projects and promoting my new business venture, Kits2Remember (www.kits2remember.com). I hope to see some friendly faces there since this is my first time teaching at Expo! 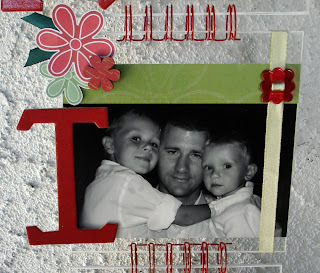 One class, “Crystal Clear Home Décor,” will be a 12 x 12 acrylic page, which can be used in an album or as home décor – your choice. 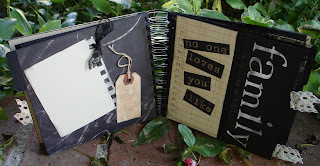 The second is “Why I Love You,” a 6 x 6 acrylic album we bind with the Bind-it-All. 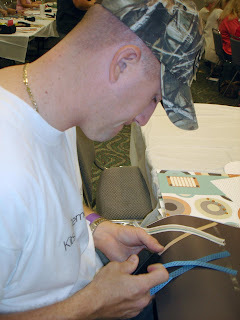 For more information about my classes, please log on to ScrapbookExpo.com and click on Orange County. There will be workshop information posted there soon, if it isn’t already. Registration begins Dec. 12. I will also be at the San Diego, Ontario and Sacramento Expos, as well! Kits2Remember will also have a booth there, and I plan to have acrylic covers, albums and shapes available in bulk, as well as chipboard in all the scrappy sizes. I am also working on getting some new and different mini book product in so that I, hopefully, have some stuff you’ve never seen – and can’t resist! I will also need some teacher’s pets for my two classes each day. I believe the deal with Expo is a free class kit for your assistance, and I’d be happy to throw some acrylic in there as well. I also need a couple of scrappers to help out in the booth in the mornings while I am in class. I would be happy to trade you your time for lots of product. It is preferable that you have experience with the Bind-it-All and Crop-a-dile so you can easily help others who don’t. If you are interested in either volunteer opportunity, please email me: jessica@kits2remember.com. I will continue to post updates on my blog: www.jessicaguthrie.blogspot.com, so add it to your favorites and check back often. Truly, I really appreciate the support of so many of you who have encouraged me, supported me … and even become customers for me! Thank you so much! I look forward to seeing you guys at Expo, if not before! I have been pretty quiet on line this week because, when I am not working, I am in the garage, finishing up my labor of love, this roughly 8 x 5.5-foot canvas mural for my living room wall. It is actually four main peices that I have joined together in layers. I have had the idea for this for over a year - it was just trying to find the time to do it! I promised myself that I would start it Thanksgiving weekend, which I did. I think it took about 20 hours to do, not including organizing the materials and photos. You will note that that top left corner is a little bare. I need to get some good pictures of Rodney's parents when we visit them later this month. I plan on video taping my description of it soon, and if I can get the technology to work properly, posting it here. So keep an eye out for that! 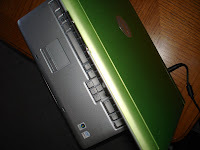 I have a new laptop, with a huge screen and it's GREEN! 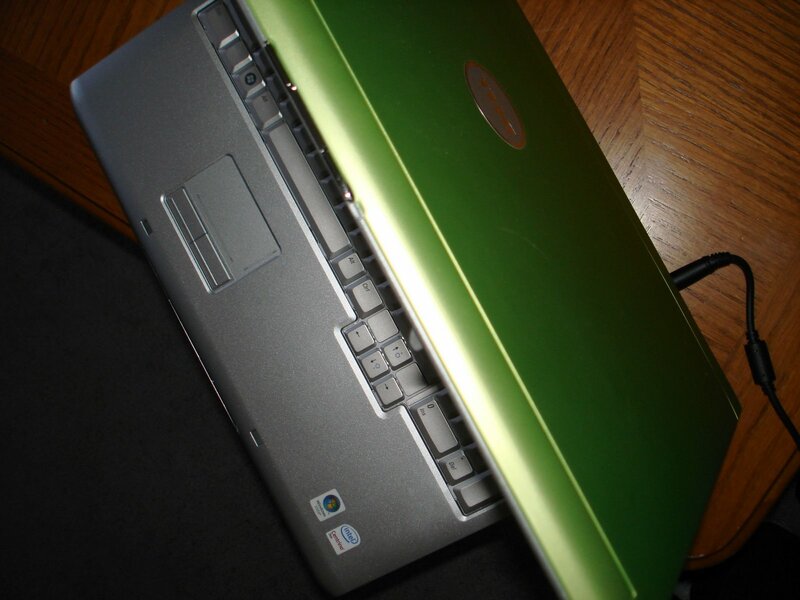 Yeah, I stupidly spent an extra $25 so that I could have a green laptop. Since K2R's logo is green, I thought I would continue the theme through to my PC. And the standard black just seemed so boring. I love the computer, it is just a pain having to reinstall programs and reset settings the way I like. Windows Vista is a challenge, too. I still can't find the "print" button, but at least the keyboard commands still work the same! K2R now has acrylic shapes! I am so excited! 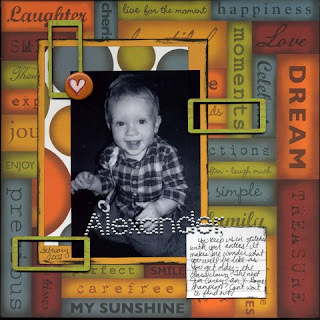 Kits2Remember now has some sturdy acylic shapes, alphas, numbers and more to create all sorts of albums, page elements, ornaments and home decor items. 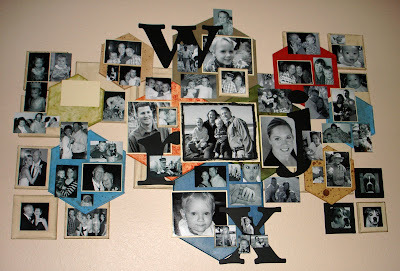 Take a look: www.kits2remember.com. The Red Bee in Tustin had their Holiday Open House and Gallery tonight to raise funds for the Susan G. Komen Foundation for breast cancer research. Scrappy Nan and I had both donated to each enter one of our projects in the gallery, to be put on display and voted on by store patrons. Nan and I tied for first place in the Altered Item category! If you guys know us at all, you will know whose project is whose ... and remember I am not a big fan of fluffy, glitzy, girly things! :) We each got a certificate for Bee Bucks to spend at the store ... plus bragging rights. LOL! Plus, scrap celebrities had donated their works of art to be placed up for a silent auction. 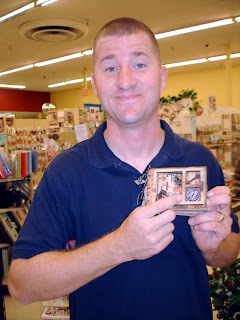 I bid on the autographed mini book from Tim Holtz and won! I gave it to DH Rodney since he is such a big fan of the man's work. 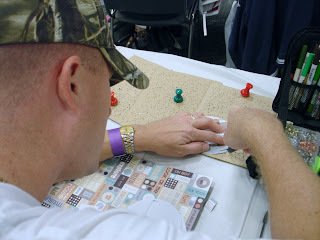 I figured we can out some scrappy photos of us in it, such as Rodney using a pocket knife to work on his Scrap Expo class layout - ha! C2R is hosting its last crop of its inaugural year - a 14-hour day crop at The Red Bee Saturday. It's not too late to sign up, we have room for a few more! For more info, visit www.crops2remember.com. I have been selected as a Daisy D's finalist! I am so excited! I am one step closer to joining the Daisy D's design team! I received an email today saying that I was a finalist for their design team call and to send my top three layouts/projects to them via email. I wasn't sure how fast they needed them, so I sent them right away. Here is what I sent ... I could only send three ... I hope I sent ones that would show my versatility and creativity! Oh, thanks a lot, Painterlady! 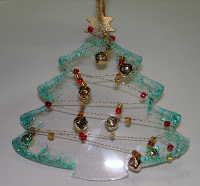 "Scrap Celebrity" and Red Bee Design Team leader tagged my blog at 1:30 a.m. today (Go to sleep, girl! )and I have to post 7 random facts about me. 1. Link (I don't know how to do this because I am a remedial blogger, but Donna's blog is in my blog list on the side there - click on it!) to the person that tagged you and post the rules on your blog. I am SUPER competetive. I have spent much of my adult life trying to contain myself as to not to irritate/offend/anger any one and act maturely about competition. As a matter of fact, after two years of winning second place in the Ontario Scrapbook Expo, my layout was not even a finalist this year. I am still getting over the disappointment. Pathetic, huh? While I have tried many alcoholic beverages (mostly in college), there is only one I LOVE (when done right, of course): Margaritas! Traditional, strawberry, raspberry, amaretto, golden ... I love them all! And what's even better is tequila never makes me hung over ... at least not so far! 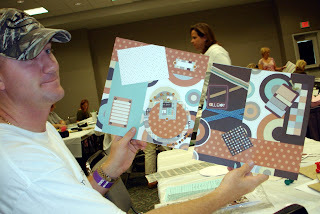 I LOVE to teach people how to scrapbook, especially when they are learning something new. They get this "lightbulb" moment, where their eyes sparkle with amazement/amusement/accomplishment and I love seeing it each and every time. I love being Rodney's wife. He instictively knows how to keep me in balance ... he allows me to be type-A and independent without allowing me to go overboard. Motherhood is not easy for me. I LOVE my boys ... they are funny, smart and talented in their own ways. 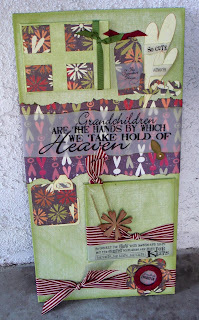 But sometimes I just want to run away to my scrap room to escape the chaos and noise. How do stay-at-home Moms do it and keep their sanity intact? Erin Bassett - 'Cuz she's a big Scrapbook Expo wiener, er, WINNER! Cindy Fahrbach - 'Cuz I want to know what MammaJammaBlabba is all about! OK, that's only 6, but I have got some work to do! The Red Bee gave thanks to "Friends and Family..."
Wow! I did some nice damage to my pocketbook at The Red Bee last night. But a 40 percent off discount on your ENTIRE purchase - by invitation only - just might do that to a girl. I wasn't the only one with a full shopping cart! Not only did they have plenty of holiday stuff available, they also have the brand new Creative Cafe from Creative Imaginations up and running. I was sure to snap up some of that stuff. 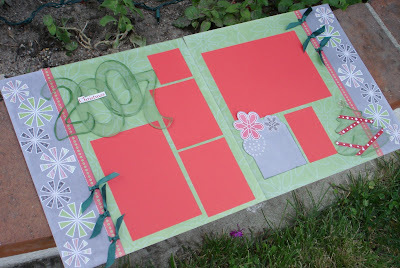 The line looks like it will help make holiday gifts in a snap with all of its coordinating papers and embellishments. I got some other holiday gifts for family members, but since I don;t want to ruin any surprises, I think I will refrain from listing them in detail! Kits2Remember and I had a busy week this week! It started off with the 2nd Anniversary sale at The Red Bee Oct. 20 and 21. I was there Saturday morning, doing an acrylic mini book make and take and showing those who stopped by for the sale how much fun the Bind-it-All is to use. Sunday, I cropped at Table Scrapz in Placentia, with the girls from Scrapbook Lifestyle: Angela Daniels, Leah Fung and Pattye Duffner. It was great to hear how they produce their online shows, and I gave them a quick Bind-it-All lesson and shared some of the new acrylic with them and the staff at Table Scrapz. 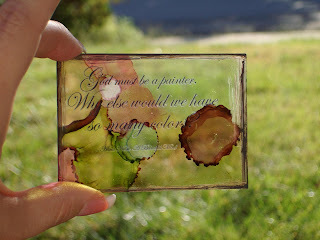 To see Angela's perspective, log on to: http://angeladaniels.squarespace.com/. 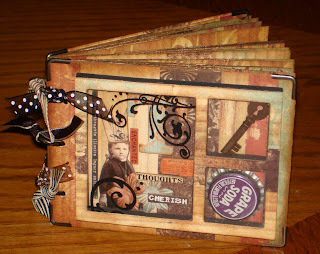 I was at Scrapbook Boulevard in Victorville Thursday evening, teaching my "Pure Girl" class, a project that is a 6 x 6 wire-bound album with acrylic cover. The ladies seems to really enjoy learning the ins and out of using the BiA and had some great questions! I had dinner with store owner Vesta Myers and we had a great chat about all sorts of scrappy stuff. 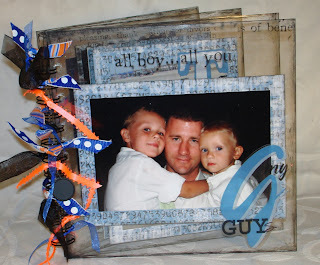 I am looking forward to going back Nov. 13 to teach my 8 x 8 all-acrylic album class "My Guys." 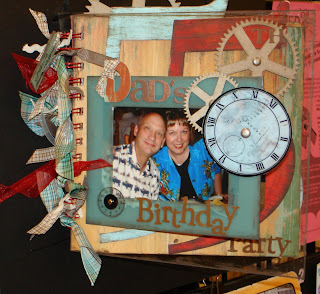 Then there was the Scrapbook Expo in Ontario Friday and yesterday. I was so excited about Strictly Scrapbooking and The Red Bee having my acrylic and, in Strictly's case, project kits, in their booths. And the acrylic was such a hit Friday, I had to bring more Saturday! Whoo-hoo! I took three classes Friday: 10 x 20 canvas class with Quick Quotes (where I sat with fellow scrap instructor Jennifer Priest and near fellow CKUer Lori Shrout), Rusty Pickle's "I Have" 6 x 6 spiral album (where I chatted it up with fellow CKUer Erin Bassett - who was also the lucky winner of the Expo's Epson printer giveaway!!!!) and Rusty Pickle's "Bloom" double-page layout. Each of classes were fun and it got me to scrap in a bit of a different style than usual. Saturday, I drug my DH Rodney with me, since I have applied to be an exhibitor and instructor at the California Expos next year, Just in case I am chosen, I needed Rodney to see what an Expo is like. We even took a class together ... SEI's Wild and Crazy double layout class. Rodney learned a lot and was able to keep up just fine in this fast-paced class. The only true testosterone moment was when he had to cut out a square from the middle of the project. He broke out his pocket knife and started slicing away. I was quick to get a photo of this manly maneuver before I stopped him and handed him an Xacto knife! 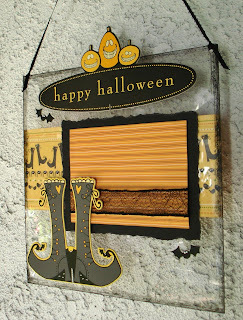 As for this week, I am busy with Halloween and getting ready for the Marine Corps ball Friday night, Saturday, my mom and I head to Rancho Mirage for the Desert Scrappers weekend retreat. I will be teaching two classes there Saturday afternoon and spending the night at the hotel, spending some quality time with my Mom, who loves the Palm Springs area. 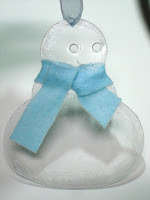 Be sure to check the Kits2Remember.com calendar page to see if there is an event or class near coming up near you! Look for these at the Ontario Expo! The Red Bee and Strictly Scrapbooking will be carrying some Kits2Remember products in their booths at the Ontario Expo this weekend. I am so excited to have my stuff out for serious public consumption! Be sure to stop by the two booths to check out the acrylic and project kits. When you are in the Red Bee booth, you might see these projects, showing off some of the creative possibilites with acrylic! Well, I won't be maintaining the Zutter Zisters web site any more. The company decided to maintain it internally. 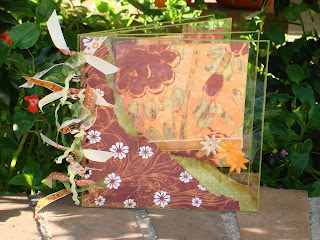 I am a bit bummed, as I enjoyed corresponding with fellow Bind-it-All lovers and posting projects to inspire others. But now I can channel my efforts in to my own web site - Kits2Remember.com. Not only do I have helpful hints and tips, project ideas and information, I also have a message board now, to help people with their mini album questions and to chat about WHATEVER! I'll continue to teach classes - I'm pretty booked up and I love seeing people get those "light bulb" moments as they create mini books and other projects in class. 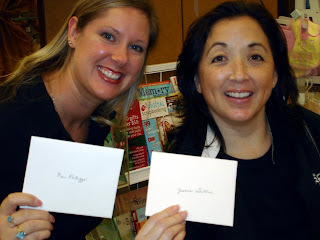 Plus, both Nan and I will do make and takes at events - once a Zutter Zister, always a Zutter Zister! I am not sure of the Zutter Zister calendar of events will be maintained, but I will continue to update my calendar on Kits2Remember.com, plus I will blog here. Looking forward to the new opportunities the future brings! Lots of classes coming up! I have a number of classes that I am teaching across SoCal in the next two months. 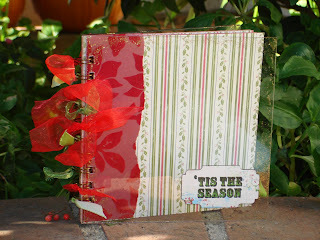 There is the "My Guys" and "Pure Girl" classes at Scrapbook Boulevard in Victorville; the purse and 4 x 4 acrylic album kit at Cool Scrapbook Stuff in Poway; a 12 x 12 acylic page and 4 x 4 mini book at the Desert Scrappers retreat in Rancho Mirage; and the acrylic holiday home decor project at The Red Bee in Tustin and Cool Scrapbook Stuff. This last one allows you to create any word or name you want because everyone gets a full Pressed Petals 5-inch Glitzy chipboard alphabet in their class kit - a $10.99 value, alone! 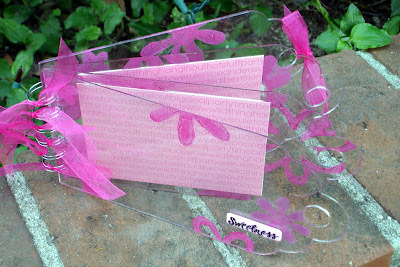 Check out more at www.zutterzisters.com/calendar. I have got a lot of classes coming up for the remainder of the year ... and it just picks up more in January! Crops2Remember plans are in full swing! Ok, if you are anything like Crops2Remember organizers Nan, Naomi and I, boy have you been busy! Both Nan and I have new kindergartners, Naomi and I have been tackling fall sports schedules and Nan has a new junior high student and a Daisy Girl Scout! Not to mention, I have been launching my new business. Whew! We're sure you're right there with us with the busy schedules! So, it's time to take a break! Nov. 10 is our Crops2Remember Day Crop - our first one EVER! We're cropping at The Red Bee in Tustin, and this crop promises to be FUN and PRODUCTIVE. We'll feed you lunch, dinner and all the snacks you can handle, so you don't have to break away from the page count for too long. 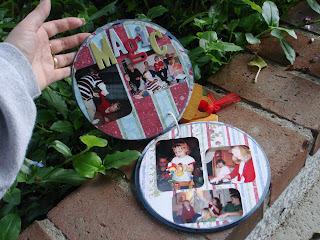 Plus, we've got two make and takes - or take and makes if you would prefer not to be interrupted! One of the make and takes is sponsored by Designs and Such, an online web site and kit club. 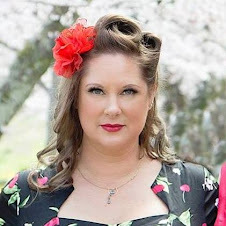 If you were at the April C2R weekend crop, you met Cyndi and Ashli. They are planning to do a popular new style of mini book - a stadium word book. You may have seen them, where each page is longer than the next and they spell out an entire word? And C2R day croppers get it FREE!!! 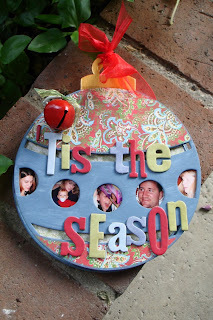 See more about Designs and Such at www.designsandsuch.com! 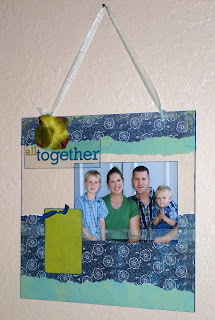 Not only that, but my new business, Kits2Remember has sturdy, clear acrylic that can be punched with the Bind-it-All and Crop-a-dile, and can be cut with Tim Holtz's Tonic Scissors. We'll be using 4 x 4 sheets of acrylic to create a cute, all-acrylic 4 x 4 holiday mini book - a perfect stocking stuffer for someone special! And it is FREE to C2R croppers, too! Find out more details at www.Crops2Remember.com and on our blog at www.crops2remember.blogspot.com, as we will post new details there ... like when we email out discounts and special offers from our sponsors to our croppers before the event! You don't want to miss out on discounts OR free delivery to the crop, do you!? Of course not! So sign up to crop today (we'll fill up fast once we leave fliers at the Ontario Expo in next weekend) and be sure to check the C2R blog often! The CE Lottery: You can't win if you don't play! Just like any other lottery! Creative Escape in Arizona had such a debacle during registration for this year's event that they decided to have a lottery system. People can register this week for the random OPPORTUNITY to register themselves and friend for the event, which is in Sept. 2008. And, OF COURSE I have my name in. Now I am just waiting to see if my name is pulled up in the lottery so that I may have the OPPORTUNITY to spend $600+ to go. LOL! 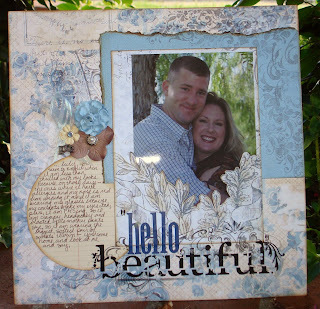 A Scrapbooker's Habitat ... a must see! Daisy D's announced yesterday that they are looking for design team members ... amd I just HAVE to enter! You can;t win if you don;t play, right?! I need to email them links that show samples of my work. I figured it wouldn't hurt to have some projects with their papers, so I took some pictures of these. The winners won't be announced until the beginning of December, so I have a few weeks' worth of waiting ahead of me. 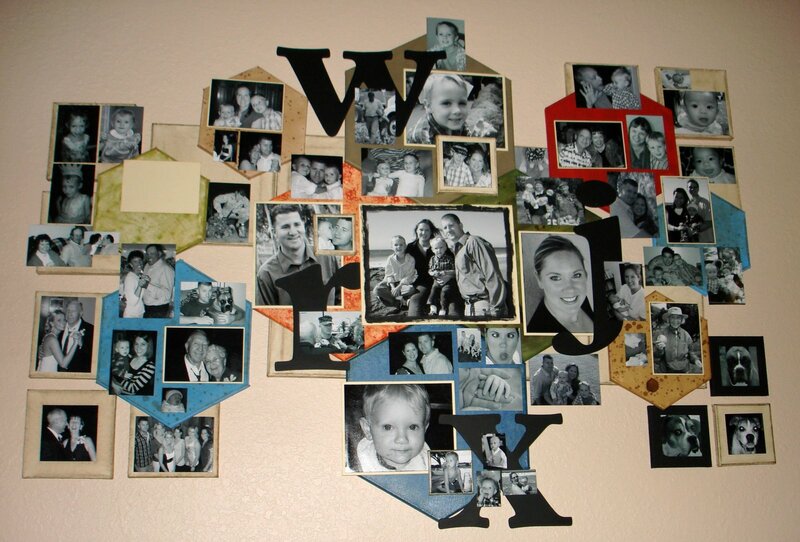 But what fun it would be to be able to design projects for them with their latest and greatest products! Wish me luck!